Protect valuable cameras from accidental slips, falls, or faulty equipment. Keep your camera secure and safe tethered to straps. Sturdy solid metal attachment will not break, shatter or fall off the strap. 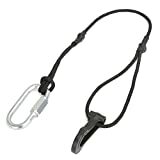 Smooth metal tether attachment easily slides up and down the strap for free range of motion while taking photos. Scotch guarded cord for water and weather resistance. Comes with a metal screw lock attachment and an extra polymer clip for alternate backup protection and peace of mind. Compatible with all SLR / DSLR / Mirrorless / GoPro Cameras and straps including Sony Alpha, Nikon Coolpix, Canon EOS, FujiFilm, Panasonic, Olympus, Pentax & more. Essential safety equipment for SLR/ DSLR / Go Pro cameras. Protect valuable cameras from accidental slips. Keep your camera secure and safe tethered to straps. 1. Thread the bottom lanyard through the camera eyelet or lug and loop it around to secure. 2. Unscrew the tether and attach to strap. Camera Tether Cable ONLY. Camera, tablet, headset and other accessories are not included. This entry was posted in Discount Photography and tagged BIRUGEAR, Black, Camera, Canon, Clip, DSLR, Extra, Fujifilm, GoPro, Nikon, Olympus, Panasonic, Pentax, Sony, Strap, Tether by Ball Photo. Bookmark the permalink.